The most popular and influential sound of Dance Music. Swedish House Essentials draws influence from the chart topping sounds of the Swedish House Mafia, namely Axwell, Sebastien Ingrosso, and Steve Angello. Merging Progressive, Tribal, Electro, Tech and cutting edge House sounds with pristine production quality to deliver that special main room sound which has become so very popular this year. The Swedish House sound has inspired artists such as Avicii, AN21, Thomas Gold, TV Rock, Tim Mason, Kim Fai, Tim Berg, Pryda, David Tort, Michael Woods and Sebastien Drums - to produce some of the most memorable and popular House music of recent years. The Swedish House Essentials sample pack from Loopmasters is packed with 555 pristine 24Bit samples, including 236 Loops and 319 One Shot Samples. In detail Swedish House Essentials includes 47 Fat and Melodic Bass Loops, 92 Club Ready Drum Loops, 97 Disco Infused and Warped Melodic Lead Hook Loops, 37 Dance FX Samples, 182 One Shot Swedish style Drum One Shots, plus 100 Synth Tones immaculately recorded for use in the multi patches. 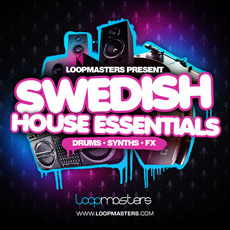 Capture the most popular and influential sound of Dance Music ina single package with Swedish House Essentials from Loopmasters today - this Exclusive collection of fresh sounds and samples is destined to grace countless future classic tracks in the House genre – check out the demo and get it while its hot!